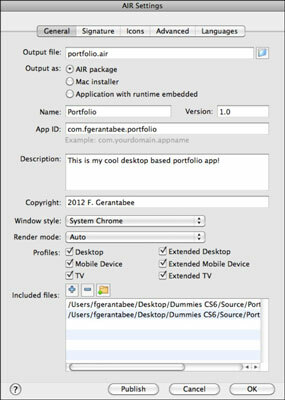 The AIR (Adobe Integrated Runtime) platform, currently in version 3, gives designers and developers using Adobe Flash CS6 a way to use their existing skills to create cross-platform desktop applications. Users can download the AIR runtime for free and install it to manage and play AIR applications directly from their desktops. 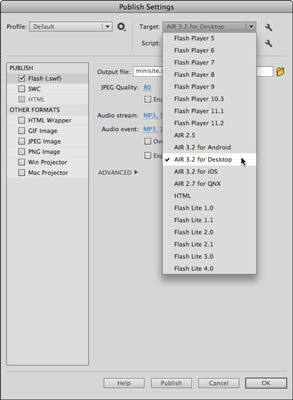 The best news for designers and developers is that AIR applications can be created from standard FLA files in Flash by making a few simple changes to your publish settings. Before you get started, download and install the Adobe AIR runtime. Open a document in Flash CS6 that you want to publish as an AIR application. Choose File→Publish Settings. In the dialog box, locate the Target drop-down list and select Adobe AIR 3.2 for Desktop as the target type. Click the Settings icon directly next to the Target drop-down list. The AIR Settings dialog box opens. Output file/Output as: Select a filename and location for your published AIR application. The Mac Installer /Windows Installer option provides an alternative installation file type for the Mac and Windows platforms. If you’re unsure which one to use, leave this option deselected. App Name: Your application displays this name when it’s installed and when it’s running on your desktop. Version: This option indicates which version of an application is installed or running. Attach a version number so that users can distinguish between versions as you create updated releases of your application. App ID: This identifier is often used to distinguish one company’s applications from another, or even several applications from the same publisher. A common naming scheme is the “reverse DNS” scheme. Copyright: Enter your copyright information here. Window Style: This setting determines how your application is “framed” within the operating system environment. You can use the default system windows (System Chrome); your own, custom frame; or even no frame (Custom Chrome — opaque or transparent). Render Mode: Determines whether or not AIR should render the application with your graphics processing unit (GPU) or the main central processing unit (CPU). Included Files: This panel shows all files to be packaged and included in the AIR application, typically a .swf file and an application manifest (.xml) file. If your application depends on other files (such as external audio or video files), you can add them here as necessary. After you finalize your settings, click the Publish button at the bottom of the AIR settings dialog box. 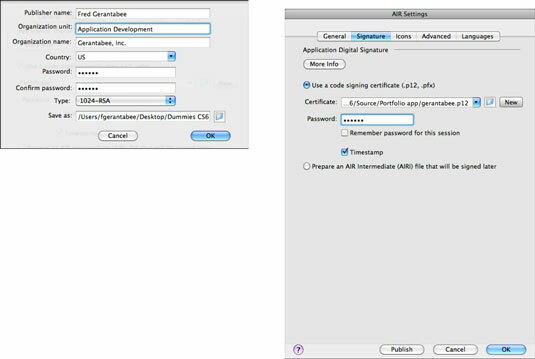 The Certificate tab of the Settings dialog box will appear, prompting you to choose or create a digital certificate for signing your application. Click the New (Mac) or Create (Windows) button on the right side and, in the dialog box that opens, fill in the information necessary to create your own self-signed certificate. Enter information for the publisher name, organization unit, organization name, country, and password, and then click Browse to choose a save location. Click OK to create and save your certificate. This step returns you to the digital signature dialog box, where your new certificate is already selected. Reenter the password you chose when you created your certificate and click Publish. A dialog box notifies you that your AIR file has been created. Click OK to exit the Application & Installer Settings dialog box and then click OK to close the Publish Settings dialog box.